Versace and Aragon's wrist watches for men and women, Black Americana collectibles, elegant collectible depression glass, crystal, and glass perfume bottles. Among presented choices in this section you can find Monet and other vintage jewelry, outdoor clothing, cast iron decor, and all widely sought after decorative items. Vintage Art Deco and different styles lamps and furnishing can provide idea in developing your own unique style. Affordable priced antique, vintage and modern items for a fantastic gift to others or yourself. Vintage unique Deer skull with antlers. Vintage Fenton pink glass vanity set perfume bottles and lidded candy dish. RESERVED FOR WENDY!!!!!!!!! Black Americana Quilted Mammy doll, handmade. Antique Brass Kerosene Lamp wall mount, English burners. Vintage Depression Pink glass perfume bottle, 275 ml. Vintage MONET multi layered tassel necklace and dangle earrings set, 1950-60s. Mushroom metal electric table lamp in Mid Century design. Vintage USAF field hooded jacket with wool liner Mil-J-4883C, 1960s. Charlie Chaplin large figurine sitting on the chair. Antique Marx & Gutherz Carlsbad chocolate, coffee, tea pot with gilded floral design. VIntage Brass Rotating gem inlaid globe with clocks and thermometer incorporated in base design. 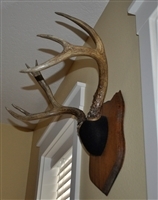 Vintage Deer antlers mounted on the wooden display. Vintage African tribal hand carved woman's head in two color finished appearance. Vintage Topsy Turvy rag dolls with topsy and eva in colorful outfits. Sarreguemines Depose 8K antique covered oval dish with gold decor and peacock feather decor from 1897 to 1900. Vintage huge clear cut crystal perfume dabber bottle in geometrical design by American Cut Crystal Corp.
BOSCA Limited edition Corespondent messenger bag, Italian leather and material, from 2006. Large cast iron stove Crescent salesman sample elaborated accents and cut our design. Versus by Versace Soho Quartz Chronograph leather strap watch, 44mm. Versus by Versace Red Key Biscayne Analog Quartz watch leather strap. ARAGON 50mm automatic watch Ultra Open Heart design, green dial. Shirley Temple 1930s composition doll, 22" tall. AMERICANA by Hazel Atlas in Star Eagle design Punch set. Versus by Versace 44mm Soho Chronograph watch stainless steel blue canvas strap, new.